Deli Flow: make sure the process is able to meet the demand of the catering business. Anyone care to help with this? (number of sandwiches sold) by 25%. Consider how you would make sure the process is able to meet the demand of the catering business. order to the customer takes thirty (30) seconds. breaks to this time. The deli employs ﬁve associates that make the sandwiches. the number of sandwiches ordered on average per day by 25%. Scenario: Imagine you are a leader at a small deli. The owner of the deli, your supervisor, has decided to expand the business by beginning a catering service. In order for this venture to be successful, your supervisor asks you to overview your current process and make sure it is efficient enough to meet the customer demand. The catering business is expected to increase sales volume (number of sandwiches sold) by 25%. Current Process: A customer places an order with the ﬁrst associate at the cash register. Once the order is placed, it is sent to the back to the kitchen for completion. Placing and delivering the order takes two (2) minutes. The second associate receives the order and selects the type of bread for the order, taking a total of ﬁfteen (15) seconds. The third associate takes ninety (90) seconds to add the meat to the sandwich. The fourth associate adds all of the vegetables and toppings. This process adds two (2) minutes. The ﬁfth and ﬁnal associate places the sandwich in a toaster oven, wraps the sandwich, and delivers the order to the customer. Toasting the sandwich takes two (2) minutes and forty-ﬁve (45) seconds. Wrapping the sandwich adds one (1) minute and delivering the order to the customer takes thirty (30) seconds. Associate Work Schedules: Associates work a total of ten (10) hours per day. For purposes of this exercise, you do not need factor in breaks to this time. The deli employs ﬁve associates that make the sandwiches. Customer Demand: Customers order on average 60 sandwiches per day. Expanding the deli into a catering business will increase the number of sandwiches ordered on average per day by 25%. Would you like to give it a try and show what you've done, so we can see what help you need? This site is not a place to get work done for you; it's a place to show what you can do and what you can't (yet), and ask for specific help. If you don't have any idea how to start, tell us that - and see if you can think of ways to do other parts. I'm just stumped on where to go with it.. I get at the current rate 6 sandwiches can be made over a 10 hour shift resulting in 60 total. But, when it ask for a 25% increase bringing 60 to 75, I'm not sure how to work backwards and tie it all in. I'm just lost. Would love to know how this problem is supposed to be worked out. So, I need to I guess shave 100 seconds off the time to meet the new 75 subs per day quote. Any help on how to get to that number? If I add up all the times for the all the steps involved in sandwich preparation, I get 600 seconds, which is 10 minutes. 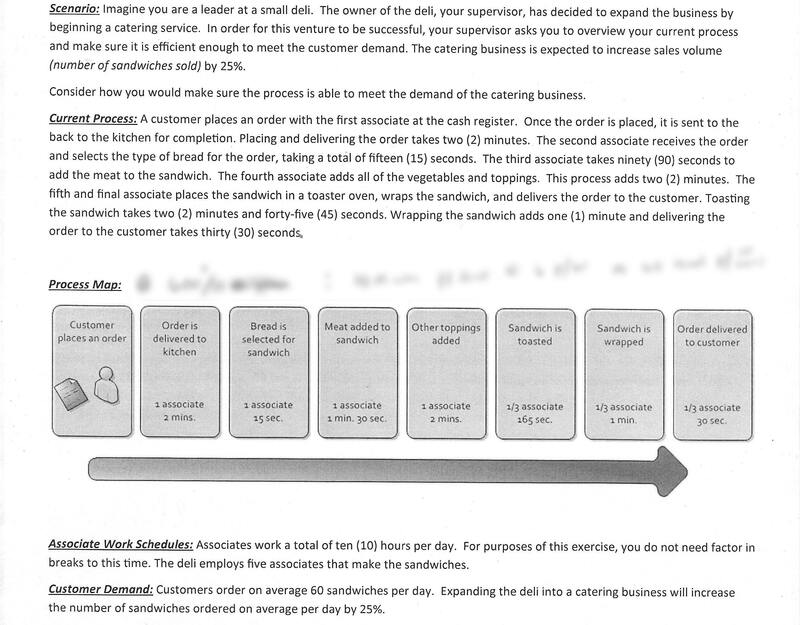 At 10 minutes/sandwich, 60 sandwiches take 600 minutes, which is exactly a full 10-hour shift. If you need to make 75 sandwiches rather than 60, then that is going to take you (75 sandwiches)*(10 minutes/sandwich) = 750 minutes = 12 hours, 30 minutes. This is longer than the shift worked by the associates. So, what you definitely know is that, given the number of associates and the current prep times, you do not have enough time to make 25% more sandwiches. Without any changes to the system, you are already at peak sandwich-production capacity. Without any changes to the system, you are already at peak sandwich-production capacity. Well, except for the fact that the conclusion is illogical. They already produce and AVERAGE of 60 sandwiches / day. Thus, some days, they MUST produce more than 60. 60 cannot be maximum production. The error in this conclusion is the fact that taking the next order does not have to wait for the delivery of the previous order. Up to 5 things can happen simultaneously. The important bottleneck, in my opinion, is that toaster oven. Can't speed it up. Yeah, absolutely, I missed that. I believe the time needs to be shaved off by downtime, if one station is Toasting the sub @ 2m45s then the station after doing wrapping and etc isn't doing anything within that period. I just need a solid math solution to account for downtime I assume. Invent a language so you can talk about it. Organize your thinking. Order: 60 * 2/60 = 2 hrs -- That's how much time needs to be spent taking 60 orders. If you have one employee (E1) on this, there are 8 hours to spare for E1. Or, E1 is busy about 1/5 of the time. Which way of thinking about it will be more useful? Bread: 60 * 15/3600 = 1/4 hr -- E2 isn't even busy. Why hand off the sandwich. Meat: 60 * 1.5/60 = 1.5 hrs -- E2 is up to 1.75 hrs. This leaves E2 8.25 hrs to spare. Or, E2 will be busy 17.5% of the time. Other: This is the same as taking orders. Now, I'm not certain this line of thinking will get us anywhere, but you have to start somewhere. Come up with a plan! Sorry, my first retort may have sounded a little impatient. That was not my intent. You gave the OP a good place to start. Keep up the good work.